At this year’s SiriusDecisions EMEA summit we hosted a lunch and learn panel focusing on ‘The Many Faces of Centralized Marketing’. 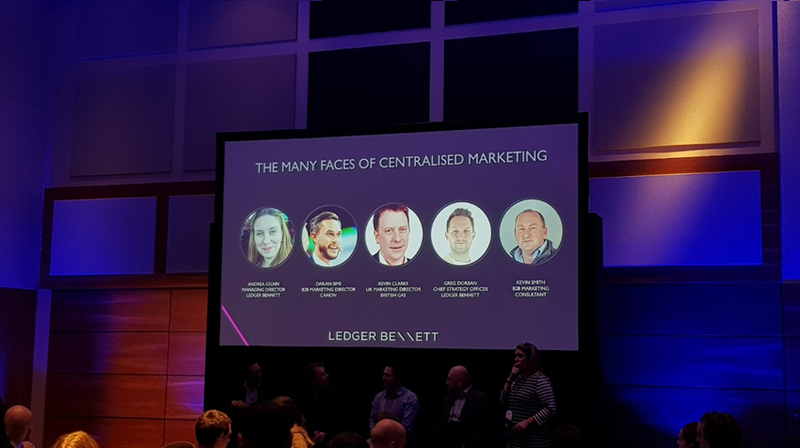 The session brought this diverse group of experienced professionals together to discuss the role of centralized marketing in the modern B2B ecosystem and featured highly valuable contributions from Canon and British Gas. Covering everything from what is centralization, to the ways in which it can be applied and the lessons that have been learnt along the way, it was a fantastic opportunity to share real-life experiences with the world. When it comes to building a centralized marketing function, it’s important to take baby steps before going all-in. Senior stakeholder and business buy-in are essential to achieving long-term success, but making so many fundamental changes all at once is risky and impractical. Break down bigger ambitions into chunks and work towards progressing in each, learning along the way and building stakeholder credibility. This approach was unanimously agreed amongst the panel – THIS is the way you win. Most people get into centralization looking for productivity gains, but this leads many to overlook the value of the performance opportunities on offer as well. Improving agility around execution, homing in on high performance areas, enhancing flexibility around budget allocation and faster change management can all be achieved with a centralized approach to marketing. These gains really are too valuable to miss. With so many pieces in play across the centralized model, maintaining agility is key to making steady progress. Ensure unnecessarily large builds or an excess of stakeholders isn’t holding back key decision makers when it matters most. In many cases, early projects are scaled to more than 20 countries/languages, so you want to make sure there’s flexibility at the start to adapt the foundation before going BIG (Kevin Smith). Achieving internal buy-in is critical to the short and long-term success of a centralized marketing function and so simplifying adoption should be a top priority (Darian Sims and Kevin Smith). If transition is difficult, friction will grow and impede progress. Stakeholders who have a significant impact on the outcome of centralization should be assisted and given the resources to make a smooth transition. For more great content from SiriusDecisions’ EMEA summit, check out the results of our live centralized marketing session research.